Silicone Pie Crust Shield, Adjustable Pie Protector, Purple. 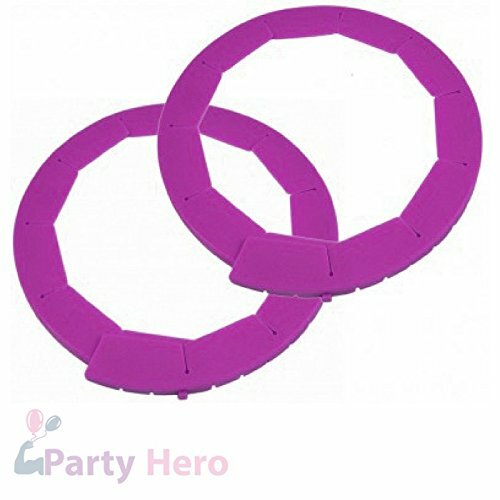 Party HeroTM Silicone Pie Crust Shield will help you achieve perfectly baked pies and help to prevent burning your pie crusts. This adjustable pie shield gently covers and protects your pie edges for a golden, light and delicious crust - Just like Grandma's Pies! Our pie crust shield adjusts to any size pie 8 to 11.5" and works great on rimmed dishes, foil pie pans and standard pie dishes. Simply secure tab lock into the notch to keep in place. Made of a high-quality silicone material our pie crust covers can protect your crust from burning and measure at a width of 1.5" for ultimate protection. Made of food-safe silicone that is heat resistant of up to 446-degree Fahrenheit. The Silicone Pie Crust Shield is easy to use, easy to clean, easy to store and GRANDMA APPROVED! Features: Adjustable- Party HeroTM pie crust shield adjusts to any size pie 8 to 11.5", works great on rimmed dishes, foil pie pans and standard pie dishes Heat Resistant- Made of high-quality silicone material that is heat resistant of up to 446-degree Fahrenheit. Easy to Use- The one piece design of our pie crust protectors make them super efficient and easy to use. Pie just like Grandma's - Assists with perfectly baked pies, Just likes Grandma's! Dishwasher Safe- Easy to clean up with dishwasher or simply clean them by hand with warm water and soap. PERFECTLY BAKED PIES, JUST LIKE GRANDMA'S!!! Party HeroTM Silicone Pie Crust Shield is Grandma APPROVED!!! ADJUSTABLE PIE CRUST SHIELDS - This pie crust shields is easy to adjust for any size pie from 8" to 11.5" and works great on rimmed dishes, foil pie pans and standard pie dishes. Gently covers and protects your pie edges for a golden, light and delicious crust - Just like Grandma's Pies! MADE OF HEAT RESISTANT SILICONE - This Silicone pie crust shield is made from a high-quality food-safe silicone material that resists heat up to 446-degrees Fahrenheit! FDA APPROVED SILICONE - Made of FDA food-safe silicone construction in Purple color, This Silicone pie crust shield won't stain or absorb odors. CONVENIENT 2-PACK - 2 Set of Silicone Pie Crust Shield - Protects pie crusts from burning. Works great on baking pans and pie dishes; safe for use in freezer, oven, microwave and dishwasher. If you have any questions about this product by Party Hero, contact us by completing and submitting the form below. If you are looking for a specif part number, please include it with your message.